There are a few wedding fairs coming up in the near future. Hopefully you will find all the services you have been looking for in one place. Breaffy House Hotel Castlebar, Co. Mayo – Sunday 27th December 2009 from 3pm-7pm with a Fashion Show at 4pm. Just to let you all know that the Professional Wedding Circle website has been revamped and relaunched. This will prove to be an extremely useful website for couples planning their special day. 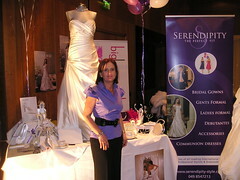 This is Margaret from Serendipity Style in Virginia, Co. Cavan. Margaret made my wedding dress and bridesmaids dresses for my wedding fado fado. Todays wedding fair at the Farnham Estate Hotel in Cavan was very busy.